What Are the Benefits of Wild Salmon Oil Capsules? What Are the Risks of Smoked Salmon? Smoked salmon goes through immersion in brine followed by rapid smoking over high heat, or slowly smoking over a low temperature. This creates a type of smoked salmon called lox. You can smoke many different salmon species, including king, chum, sockeye, coho, chinook and pink salmon. You can eat smoked salmon directly out of the package or serve it as part of a meal. One serving of smoked salmon is about 3 to 3.5 ounces. Each serving contains about 100 to 140 calories, depending on the species. A significant chunk of its calories come from protein, and each serving of smoked salmon provides more than 20 percent of the daily recommended protein intake. Your body uses this protein as a source of amino acids -- chemicals it needs to maintain heathy muscles, as well as build new skin, bone and cartilage. Like other animal-based foods, smoked salmon provides all the amino acids that your body needs but can't make on its own. 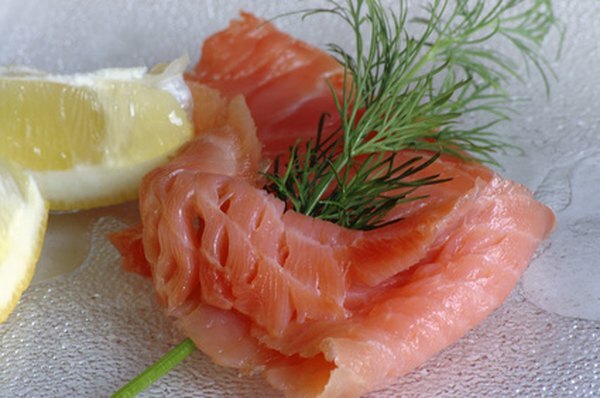 Smoked salmon provides you with vitamins B-12 and B-6. Vitamin B-12 plays a key role in the health of your nervous system, because it helps you make chemicals needed for nerve communication, and low B-12 levels cause permanent nerve damage. Vitamin B-6 also contributes to brain function and helps you make red blood cells. Each serving of salmon contains 0.3 milligrams of vitamin B-6 -- 23 percent of your recommended daily intake -- along with all the vitamin B-12 you need in a day. Smoked salmon is high in omega-3 fatty acids, a healthy type of fat. The American Heart Association recommends that people eat two or more servings of salmon or other fatty fish containing omega-3s every week. Omega-3 fatty acids are a necessity for proper brain functioning, and help maintain heart health by lowering triglycerides, slightly lowering blood pressure, reducing the risk of heart arrhythmias and slowing the growth of arterial plaques. Smoked salmon contains less omega-3 fat than fresh salmon. Wild caught varieties also tend to be lower in omega-3s than farm-raised salmon. The smoking process increases the salt content of salmon, which may be of concern to individuals monitoring their salt intake. A single serving of smoked salmon has 784 milligrams of sodium, while a serving of lox contains about 2,000 milligrams of sodium. According to federal dietary guidelines, most individuals should consume no more than 2,300 milligrams of sodium per day, and people at high risk for hypertension should aim for less than 1,500 milligrams a day. For this reason, you should consume smoked salmon as an occasional treat. One concern involving smoked salmon is the potential for contamination by the bacteria Listeria. This typically produces mild symptoms of food poisoning if ingested, but can be more dangerous for pregnant women and the elderly. Lox is more prone to Listeria contamination than salmon smoked at higher temperatures. Some individuals may be allergic to salmon, especially if they have allergies to other fish or seafood. Some people may also have concerns about environmental pollution in fish, including mercury contamination. Is Tuna in Water or Oil More Healthy? Can You Take Flax Oil & Fish Oil Together?